Times have changed since Marlboro ruled the tobacco industry and the traditional cigarette has evolved into a battery powered, fruit-flavored, smoking device that looks like a USB thumb drive. “Hey man are you Juuling later tonight?” is a common phrase heard among young people across the country. But where technology has succeeded in developing a safer product for nicotine use among addicted adults, the government has failed to regulate the distribution of this product to teenagers. 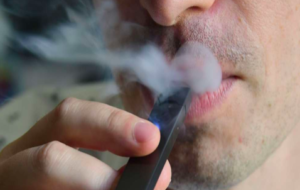 If and when federal regulations are put into place, users believe that the popularity of JUUL and other vaping devices is already so powerful, both socially and physiologically, that any aggressive attempt to deflate the trend will cause a generation of technologically savvy teenagers to turn to the internet and create a surging and potentially dangerous black market. “JUUL changed everything,” said Matthew Myers, President of the Campaign for Tobacco-free Kids, at an E-Cigarette conference at NYU this past Friday. Myers goes on to mention a campaign involving a party-bus, young women, and paid influencers going on in Atlanta. Another component of their criticized advertising is the names of the flavors they use such as “cool cucumber” and “creme brulee” as being purposefully attractive to youth. Even the founder of the E-Cigarette Forum, the largest online e-cigarette forum, and a proponent of vaping admits to JUUL’s younger following. “The average age of users on our forum is about 35 but unfortunately JUUL’s demographic skews towards the young,” said the company’s CEO Oliver Kershaw. On June 15th 2018 New York State declared vaping illegal anywhere smoking was prohibited including workplaces, bars, hospitals, mass transit, and on the campuses of grade school and higher educational institutions – and yet the vaping culture still thrives throughout social media platforms. Kylee Brehm started smoking cigarettes at age 16 and turned to vaping at age 18 so as to not disappoint her mother, stating in a online forum for influential female vapers that, “I hid my smoking from her because she told me it would break her heart if I started. So when I turned 18 I went out and bought my first setup.” Kylee also started a vaping instagram account called “Kyleevapes” with the description that reads “just for fun.” Kylee’s instagram account shows her vaping, blowing smoke, and endorsing several vaping products almost every single day, sometimes posting twice a day, creating a total of 2,537 posts over the past four years. She manipulates the smoke into creative and artsy shapes and videos making it look “cool.” And it worked. She has over 215,000 followers and is growing. With each new post, new promotional opportunity, and new ‘like’ she is positively encouraged to continue vaping online and consume high levels of nicotine on a daily basis. Every JUUL pod contains the equivalent amount of nicotine as an entire pack of cigarettes. “I started smoking JUUL to be cool and with the in crowd, now I can’t stop smoking JUUL,” said Myers in reference to kids that he believes wouldn’t dream about smoking an entire pack of cigarettes and are now chomping down on one or two pods a day. 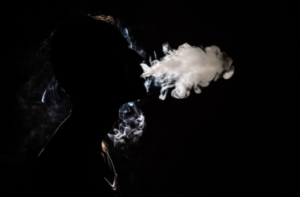 The exceedingly high levels of nicotine found in JUUL products is one of the main concerns parents and officials have regarding its distribution to youth. But despite this concern there is simply not enough research and scientific data out there to support any claim of long-term side effects. 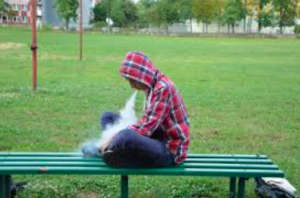 On September 12th 2018 FDA Commissioner Scott Gottlieb issued a statement declaring youth vaping an ‘Epidemic’. “Given the magnitude of the problem, we’re requesting that the manufacturers of these brands and products come back to the FDA in 60 days with robust plans on how they’ll convincingly address the widespread use of their products by minors, or we’ll revisit the FDA’s exercise of enforcement discretion for products currently on the market,” the statement read. With only about 30 days left to comply with the FDA’s call to curb marketing efforts to youth, companies like JUUL have devoted $30 Million to meet the demands of this request and made some adjustments to their products changing the names of the flavors from “cool cucumber” to just “cucumber.” However, despite these attempts to regulate teenagers have not been thwarted from finding and obtaining their JUUL e-cigarettes. An anonymous user told me that she created a fake eBay account about year ago, when she was under 18, and would buy JUUL directly without having to provide any age verification. The practice is common enough that in April of this year the FDA demanded that eBay remove JUUL products from it’s e-commerce site so this exact type of underage JUUL purchases couldn’t happen. When asked what happened after she could no longer buy off eBay she told me that she went to another local website called stokedct.com where she could buy JUUL directly again without any kind of age verification at all. The E-Cigarette forum conducted a 75 question online poll to 10,000 of its users in July asking what they would do if e-cigarettes were banned tomorrow; 79% of them said they would turn to the black market and 14% said they would return to smoking regular cigarettes. Fears of the vibrant e-cigarette black market are strong among anti-smoking advocates. With this do-it-yourself mentality, Kershaw notes that “millennials have better access to information than ever before” and taking into account the looming threat of losing all access to online sales of e-cigarettes, a surge in teenagers turning to the internet to find potentially dangerous ways of getting their nicotine high seems all too probable. The FDA is scheduled to reveal more about its future plans to regulate this November and will also reveal new data about e-cigarettes and minors.